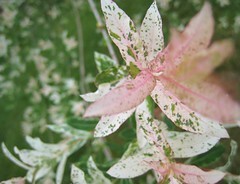 The plant: This deciduous shrub produces foliage with green, pink and creamy-white variegation. The delicate catkins that appear in spring are followed by bright pink shoots which open to mottled leaves. In winter the bare stems are reddish. 'Hakuro-nishiki' is sometimes grafted onto a single stem to form a standard (tree form). Most often, the cultivar is sold as a shrub. The solid green Salix integra is native to Japan and is a shrub with pendulous shoots. 'Hakuro-nishiki' should reach a height of five feet with a spread of four feet and is hardy to USDA Zone 5. How to use it: Plant as a specimen (by itself) or in a shrub border. A dark evergreen backdrop would show off the winter color and the bright foliage of late spring.